Nevertheless, this historical episode indicates that it is possible for highly regulated economies to reduce government spending without generating a collapse in private spending. Central to this, however, is one important factor: The price mechanism must be free to efficiently direct resources to their best valued uses. The decade following World War II is fondly remembered as a period of economic growth and cultural stability. America had won the war and defeated the forces of evil in the world. The hardships of the previous fifteen years of war and depression were replaced by rising living standards, increased opportunities, and a newly emerging American culture confident of its future and place in the world. It is not surprising that politicians of all stripes harken back to those halcyon days to make a case for their agendas. But a closer examination of the actual events of the immediate postwar period provides a picture that is much more nuanced and at odds with the world view that government intervention is the essential ingredient of prosperity. In his 2009 State of the Union address, President Obama likened his stimulus plan to earlier popular government initiatives, using post-World War II references: “In the wake of war and depression, the GI Bill sent a generation to college and created the largest middle class in history....Government didn’t supplant private enterprise; it catalyzed private enterprise.” Nobel prize winner and liberal New York Times columnist Paul Krugman has also extolled the role of government in World War II and the post–World War II recovery, claiming that “World War II was, above all, a burst of deficit-financed government spending...[that] created an economic boom... [that] laid the foundation for long-run prosperity." Both President Obama and Professor Krugman are using very broad historical strokes to make the case that an activist federal government is essential to prosperity. These strokes have an air of plausibility and contain elements of truth. But a closer examination of the actual events of the immediate postwar period provides a picture that is much more nuanced and at odds with the world view that government intervention is the essential ingredient of prosperity. Although the postwar era was indeed inaugurated by a huge contraction in government spending that was made possible by the Allied victory, the end of deficit spending did not send the United States into a deep depression. This, of course, reflects a world view that sees aggregate demand as the prime driver of the economy. If government stops employing soldiers and armament factory workers, for example, their incomes evaporate and spending will decline. This will further depress consumption spending and private investment spending, sending the economy into a downward spiral of epic proportions. But nothing of the sort actually happened after World War II. 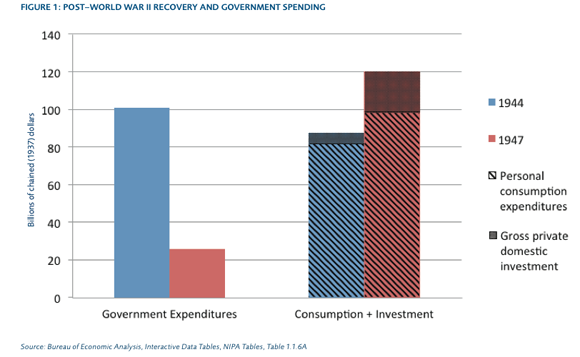 In 1944, government spending at all levels accounted for 55 percent of gross domestic product (GDP). By 1947, government spending had dropped 75 percent in real terms, or from 55 percent of GDP to just over 16 percent of GDP. Over roughly the same period, federal tax revenues fell by only around 11 percent. Yet this “destimulation” did not result in a collapse of consumption spending or private investment. Real consumption rose by 22 percent between 1944 and 1947, and spending on durable goods more than doubled in real terms. Gross private investment rose by 223 percent in real terms, with a whopping six-fold real increase in residential- housing expenditures. The private economy boomed as the government sector stopped buying munitions and hiring soldiers. Factories that had once made bombs now made toasters, and toaster sales were rising. On paper, measured GDP did drop after the war: It was 13 percent lower in 1947 than in 1944. But this was a GDP accounting quirk, not an indication of a stalled private economy or of economic hardship. A prewar appliance factory converted to munitions production, when sold to the government for $10 million in 1944, added $10 million to measured GDP. The same factory converted back to civilian production might make a million toasters in 1947 that sold for $8 million—adding only $8 million to GDP. Americans surely saw the necessity for making bombs in 1944, but just as surely are better off when those resources are used to make toasters. More to the point, growth in private spending continued unabated despite a bean-counting decline in GDP. As figure 1 shows, between 1944 and 1947 private spending grew rapidly as public spending cratered. There was a massive, swift, and beneficial switch from a wartime economy to peacetime prosperity; resources flowed quickly and efficiently from public uses to private ones. Although the GI Bill surely had a positive effect in the 1950s on the educational level of U.S. workers, the bill played a very minor role in keeping the immediate postwar unemployment rate low. At its height, in the fall of 1946, the bill only took about 8 percent of former GIs to college campuses and out of the workforce. Before the war, a number of government programs attempted to move unemployed workers into the labor force, with little success. In the years under discussion, however, no new government program was facilitating this transition; indeed, it was the end of government direction of the economy that facilitated the postwar boom in private employment. The U.S. war economy from 1942 to 1945 can be described as a command economy. Extensive economy-wide price controls outlawed the use of the price mechanism to direct resources to their most highly valued uses. An array of federal bureaucracies, including the Office of Price Administration, the War Production Board, the Office of Civilian Requirements, and War Manpower Commission directed resource allocation to arm and equip the millions of American and Allied soldiers in battle against the Axis enemy. Arms manufacturers could obtain raw materials without bidding up prices as government orders directed the materials to them by edict. Although these efforts were uniformly supported by the public at the time, they inevitably reduced the resources allocated to the production of private consumption and investment goods. Moreover, price controls and bureaucratic directives were pervasive. Certain consumer goods, such as automobiles and other durables, were simply not produced in the war years. There were periodic shortages of goods ranging from milk to men’s pajamas. The quality of goods deteriorated as producers tried to evade price ceilings, and illegal markets were pervasive. The government actually seized firms and directed their operations. When the war ended, however, the command economy was dismantled. By the end of 1946, direct government allocation of resources—by edict, price controls, and rationing schemes—was essentially eliminated. Tax rates were cut as well, although they remained high by contemporary standards. By any measure, the economy became less subject to government direction. Despite the pessimism of professional economists, resources that previously would have been directed to the production of war goods quickly found their way to other uses. The business community did not share the economists’ despair. A poll of business executives in 1944 and 1945 revealed that only 8.5 percent of them thought the prospects for their company had worsened in the postwar period. A contemporary chronicler noted that in 1945-1946 businesses “had a large and growing volume of unfilled orders for peacetime products.” In fact, the elimination of wartime economic controls coincided with one of the largest periods of economic growth in U.S. history. It’s important not to overgeneralize; each historical period reflects unique circumstances. No one would recommend embarking on a destructive conflict and subjecting the economy to draconian wartime regulations in order to generate economic health. Nevertheless, this historical episode indicates that it is possible for highly regulated economies to reduce government spending without generating a collapse in private spending. Central to this, however, is one important factor: The price mechanism must be free to efficiently direct resources to their best valued uses. This, in turn, implies that regulations that impede this market process must be eliminated as government spending declines. Ironically, it seems that the postwar prosperity that America enjoyed after World War II was less the result of a carefully crafted political agenda than a by-product of what government stopped doing.